Our roast beef lunch is definitely a classic and a favorite. 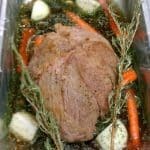 We slow roast the beef to perfection with fresh sprigs of rosemary, onions, carrots, garlic cloves, thyme and fennel seed. 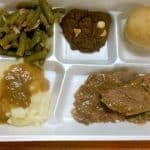 This satisfying dish comes with mashed potatoes and rosemary infused brown gravy made from the beef drippings and juices. We also serve it with Southern style green beans, homemade whole wheat yeast rolls and a delectable dessert. This Italian dish is a crowd favorite and is served with chicken if the student wishes. We also serve it with garlic bread, salad, fruit and dessert. We want our students to feel special, but especially on Valentine’s Day. We offer a lunch filled with “love” that included spaghetti and meatballs, garlic breadstick, Caesar salad, fruit and a special dessert. St. Patrick’s Day is celebrated at HLS with a festive traditional Irish meal including corned beef and cabbage, mashed potatoes, corn, yeast roll, fruit and a special “green” dessert.